YUM!! Can’t wait to make these when I get home from vacation!! I love my Vitamix! It whips up my morning frozen fruit smoothies in a second, but I’ve never tried making any kind of batter with it…this will be fun to try!! I used medjool. I made another dozen yesterday too. So good. I know what you mean about loving your vitamix and kinda missing it. We are leaving on vacation soon and I have actually contemplated taking it with us. We are staying in a condo so that I can still prepare all of our own food and it would be really great to have it particularly for super smooth quick morning smoothies. I’ve been itching for a grain-free, sugar-free dessert, but want to use unripe bananas because I don’t want to wait for our bananas to ripen… do you think this would still taste good? Or should I wait for them to ripen? 🙂 Thanks! Definitely wait for them to ripen. They will taste pretty bland with unripe bananas. I heard they ripen faster of you keep them on the counter in a brown paper bag. Good luck! Okay, thank you very much for the advice & such a quick response. 🙂 I can’t wait to try this recipe! Hurry up & ripen, bananas! Crap… I just made the batter & it’s all ready to bake… but I don’t know at what temperature! Your recipe says 50 minutes, so I’m assuming that it’s probably not that high… but I have no clue. I know you probably won’t see this comment within the next five minutes, so I’ll just guess for now & hope everything turns out all right! But, just for future reference, could you add in the temperature to this recipe? Oh No! I’m so sorry. I am assuming I baked these at 325 because of the 50 minute time frame. Now I need you! Could you let me know what temp and times you used and how it turned out? I feel terrible. I really hope these work out for you despite my slip up. Good to know that the bag trick worked. I’ve never had to do that. I posted a reply earlier, but I think I forgot to submit it! I ended up baking the muffins at 350, for around 30~ish minutes. 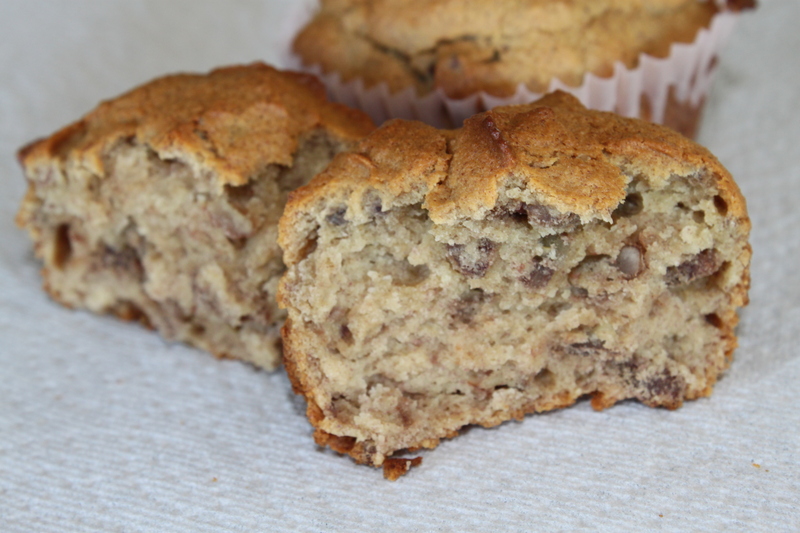 I think next time I will bake for longer, because they were just a little bit spongy… BUT still very tasty! 🙂 Thanks so much!